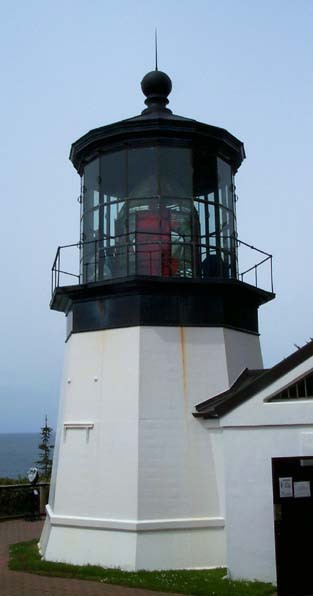 Cape Meares Lighthouse is one of the most educational and beautiful stops along the Three Capes Scenic Route. If solitude is what you desire this is not the stop for you (try Cape Meares State Park instead), but if you want to be educated while looking at breathtaking ocean views this jewel will not let you down. Climbing up a narrow spiral staircase, attached to the interior wall of the lighthouse, you arrive mid-level where you can see the gears which once used to turn this engineering wonder. Following the narrow walkway past the gears, you ascend a short steep staircase, with little headroom and arrive at the top. A narrow catwalk will take you around the interior, next to the eight sided lens. The lens was made in France and is still considered to be world class. The original lamp burned 10 gallons of kerosene daily in it’s five wick lamp. We found the State Park Volunteers to be very helpful and informative.